Brit. Cact. Succ. J. 16(1): 15 (1998):. Altitude: 200-600 metres above sea level. 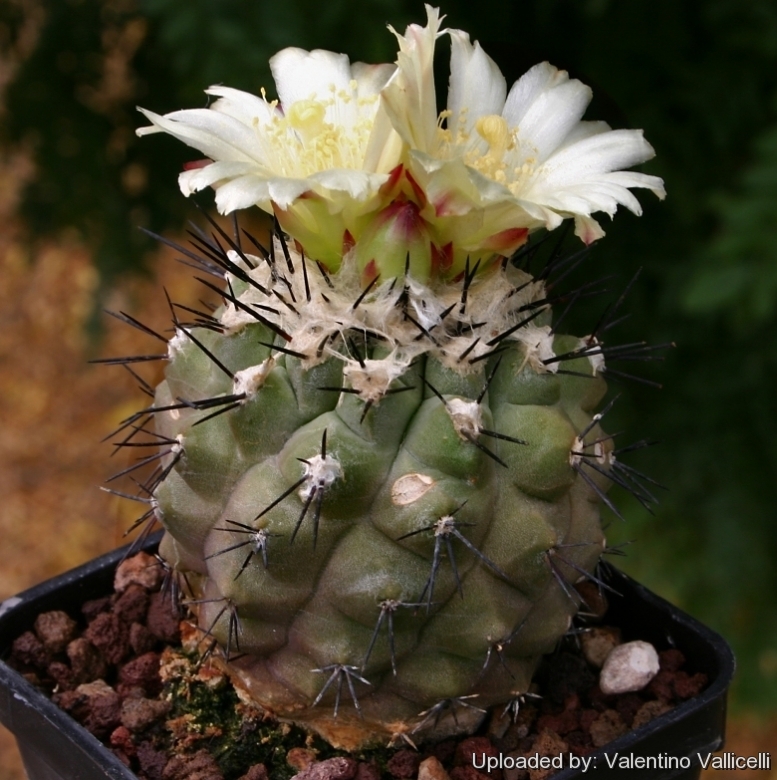 Description: Copiapoa montana is a controversial taxon that has undergone classification changes, Anderson chosen to lump it with Copiapoa taltalensis, while other authors suggest that it is intermediate between Copiapoa cinerascens and Copiapoa hypogea and consider it a good species rather than a local form of Copiapoa taltalensis. 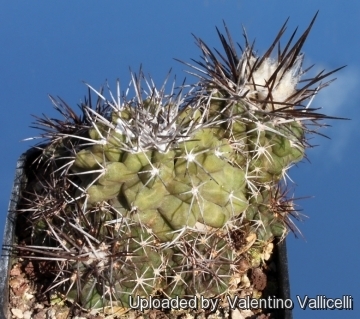 Habit: It is a geophytic cactus arising from a large tuberose root. It is at first solitary but can slowly branch from the base to form moderately large clump. Roots: Large tap-root connected to the stem base through a slender neck. Stem: Globular flattened in the young plant, later columnar, 4-20 cm tall, 4-10 cm across, pale green or olive green eventually lightly tinged with brown in the sun. Ribs: 10 to 17 prominent, divided into large tubercles about 7 mm high. Areoles: Round 3-10 mm in diameter, 5-15 mm apart and covered with white or brown felt. 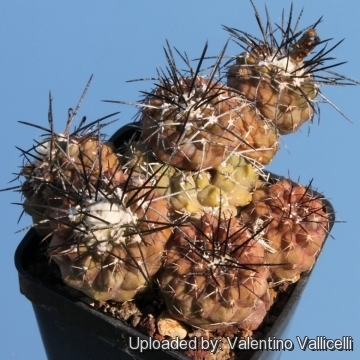 Spines: Straight or slightly curved, brownish-black to black (later grey). Radial spines: 4 to 9 straight or slightly curved, stoutly needle-like, 5-20 mm long. Central spines: 0 to 3 stronger, straight, and about 2 cm long as well. Flowers: The flowers arise on the crown, often several at a time, nearly hidden in the dense wool. 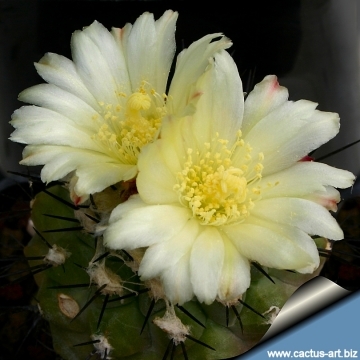 They are glossy, pale yellow, with broad limb, 5.5 cm in diameter, and with a faint scent. 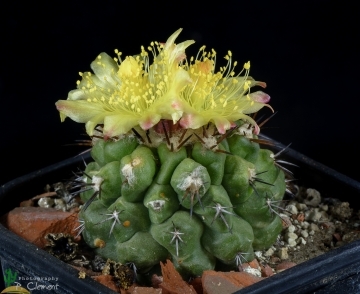 The filaments, anthers and style are yellow, the 7 to 12 lobed stigma darker. The ovary measures about 1 cm across. 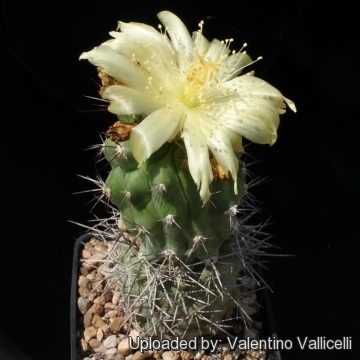 It is one of the first species to flower, even 2 to 3 year old seedlings may bloom. Blooming season: Flowers throughout the whole summer. Fruit: 1-1.3cm in diameter, reddish. 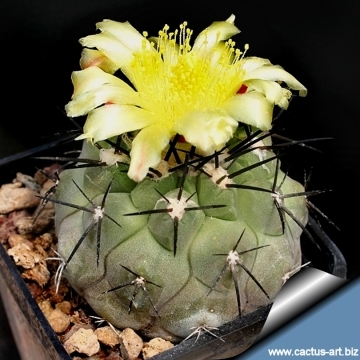 Seeds: Small, black glossy 1,2-2 x 0,9-1,2 mm. 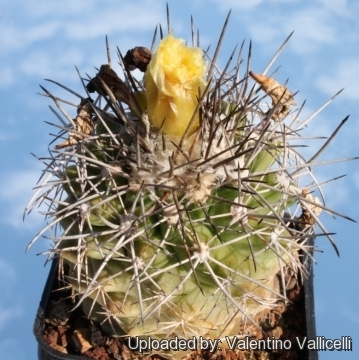 Notes: Copiapoa montana is used as grafting stock for other copiapoas. 2) Schulz R., (2006). “Copiapoa 2006” Schulz Publishing. 5) F.Ritter “Kakteen Südamerika” 3: 1072 1980. Propagation: Seeds, which has good powers of germination, or from shoots which are grafted.